Strawberries were considered a luxury item that was enjoyed by the wealthy until around the mid – 19th century. Once the railways were built and more rapid means of transportation established, strawberries were then shipped longer distances and not reserved just for the wealthy. Did you know that the strawberry is the most popular berry in the world. The fragrantly sweet juiciness and deep red colour of strawberries can brighten up both the taste and plates of any meal. There are more than 600 varieties of strawberries and each has their own flavour, size and texture. A luscious red berry with a sweet taste can easily be picked out by its red flesh that has yellow seeds piercing its surface, and the small, regal, green leafy cap and stem that adorn its crown. Strawberries not only look like a fruity heart-shaped valentine, they are filled with antioxidants that promote good health. In studies, researchers have found that strawberries help protect the brain from stress and may reduce the effects of age-related related diseases in brain function. Researchers found that feeding aging rats strawberry-rich diets significantly improved both their learning capacity and motor skills. In terms of the good old fashioned nutrients, strawberries are an excellent source of vitamin C which helps to promote healthy teeth and gums, vitamin K which is important in helping the blood to clot and last but not least, manganese which helps to combat fatigue. When you are buying your berries, choose berries that are firm, plump, and free of mold. Look for berries that have a shiny, deep red colour and green caps attached. Since strawberries, once picked, do not ripen further, avoid those that are dull in colour or have green or yellow patches. Medium-sized strawberries are often more flavourful than those that are excessively large. If you are buying strawberries prepackaged in a container, make sure that they are not packed too tightly which may cause them to become crushed and damaged. Make sure that the container has no signs of stains or moisture which is an indication of possible spoilage. 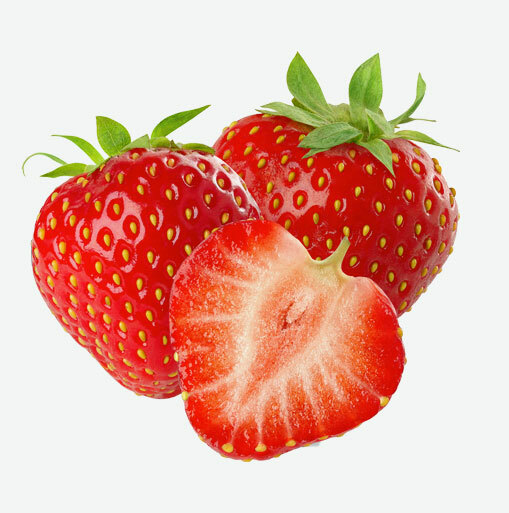 Like all berries, strawberries are very perishable, so great care should be taken in their handling and storage. Before storing in the refrigerator, remove any strawberries that are molded or damaged so that they will not contaminate others. Replace unwashed and un-hulled berries in their original container or spread them out on a plate covered with a paper towel, then cover with plastic wrap. Strawberries will keep fresh in the refrigerator for one or two days. Make sure not to leave strawberries at room temperature or exposed to sunlight for too long, as this will cause them to spoil. These delicious fruits are perishable and should not be washed until right before eating or using in a recipe. Do not remove their caps and stems until after you have gently washed the berries under cold running water and patted them dry. This will prevent them from absorbing excess water which can spoil their texture and flavour. To remove the stems, caps and white hull, simply pinch these off with your fingers or use a paring knife. Add sliced strawberries to a mixed green salad. Layer sliced strawberries, whole blueberries and plain yogurt in a wine glass to make a parfait dessert. Mix chopped strawberries with cinnamon, lemon juice and maple syrup and serve as a topping for waffles and pancakes.